It is widely accepted that the earliest known hybrid tea was bred in France in 1867 by nurseryman Jean-Baptiste Guillot. He named it La France and it was reportedly created by crossing the Madame Bravy tea rose, with the Madame Victor Verdier hybrid perpetual rose. That is where the class name hybrid tea first came from. In the decades since that first creation, there were numerous other varieties bred, however this new type of rose didn't really take off until the year 1900 when the rose Soleil d'Or was bred. The Soleil d'Or rose was bred in France by Pernet-Ducher, who lived in Lyons. It was that same century that hybrid tea roses solidified their place in history as the most popular types of roses, when Francis Meilland introduced the famous Peace rose near the end of the Second World War. Since that time the Peace roses has been one of the most popular cultivars of roses that have ever been introduced to the world, and you can still purchase them to this day to grow in your garden. Being a cross between two parent roses, it is not surprising that hybrid tea roses share their parental traits, only to a lesser extreme. 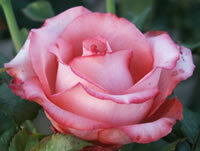 Where tea roses tend to be very tender plants, the hybrid perpetual are very hardy. This crossing gives the hybrid teas a more versatile adaptability to various growing conditions, while still retaining many of the preferable traits of their parents. Roses that fall into the hybrid tea class tend to lean toward the shape of upright bushes and will grow anywhere between 2 and 6 feet tall depending on the variety and growing conditions. Hybrid tea roses are prized by florists around the world for bouquets and arrangements because their blooms tend to grow individually on somewhat long stems, making them perfect for cuttings. While there are some varieties that are tolerant of partial shade, roses in general require a lot of sun light to produce blooms and you will not get the same results in a shady location, as you would a site that gets 6 to 8 hours each day of direct sun light. Hybrid teas also need soil that drains well, but still has some measure of moisture retention for them to absorb the nutrients. Planting hybrid tea roses is actually easier than most people believe and it depends in part on where you bought your roses from. Before we get to that however, I always suggest to newer growers to take a trip to their local garden center and pick up a bag of organic compost before they do any digging around their garden. When you dig a hole for planting, mix in the compost with the loose soil at a ratio of 2 parts soil to 1 part compost. This makes for a great soil amendments and I've discovered roses absolutely love it! If you found your hybrid teas locally, then most likely they have already been planted and are established and read to bloom. 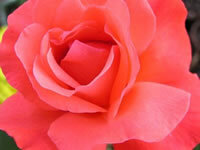 These are the easiest types of roses to plant because the guesswork is already take care of for you. Dig yourself a hole that is about twice the diameter of the container the plant came in, and equally as deep. This will give you ample room around the root ball for your new soil mix, while still keeping the bud union at the same depth it was planted in the container. If you ordered your hybrid teas from an online nursery however, it's a good bet they shipped them to you as a bareroot plant, still in its dormancy. Many growers are intimidated by bareroot plants but there is really no reason to be. The first thing you should do is soak the plant overnight in a bucket of lukewarm water to rehydrate the plant. The following day, dig yourself a hole that is as wide as the longest roots on the plant, and plenty deep enough so that you can mound up some soil in the center for the plant to sit on, but still keep the bud union about an inch or two below the surface of the soil. Set your hybrid tea in place and spread the roots out in all directions around the mound, then back fill the hole about halfway using your new soil mix. Take the garden hose and water the loose soil heavily until it flows around the roots like mud. Go ahead and then back fill the hole the rest of the way and give it one more heavy watering to fully settle the soil. This should ensure that no air pockets have formed around the roots. Taking care of hybrid tea roses is really easy and they aren't usually as high maintenance as many people think…most varieties anyway! The first thing you have to make sure of is that you are providing them with ample water, but without overwatering them. This might seem like a contradiction but it isn't. Too little water and the roses won't get enough nutrients. Too much water and you risk exposing them to a whole range of diseases and problems. A good rule of thumb is one deep watering each week. You can stick your finger into the soil at the base of the plant to check for moisture. If it comes out wet, then you do not need to water again yet. You should also take care not to water your roses from the top down and needlessly soaking the leaves. 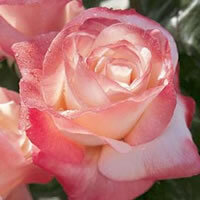 Drier leaves lead to healthier roses so always try to water just the base of the plant when possible. You can also give your roses a dose of a good, granular, all-purpose fertilizer in the early spring when the leaves start to bud. I usually try to avoid the liquid chemical fertilizers myself as I've discovered they too easily will burn some varieties of roses, if not applied properly. For repeat blooming varieties of hybrid teas, you can give them additional feedings over the course of the growing season to keep them in bloom. For these, I will typically give them a second dose just as the first big bloom starts to form. I will give them a third dose around mid-summer to promote late season blooms. Just follow the dosing instructions on your fertilizer and I will usually wait at least 4 weeks in between feedings. Pruning the hybrid teas is pretty simple as they do not tend to get very big and cumbersome. 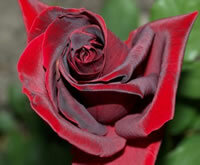 You should almost always prune your hybrid tea roses in the early spring before the leaves form. The first thing you should do is remove all the dead wood from the previous season, along with any canes that look discolored from disease. Most of the time I will simply remove canes that look unhealthy for any reason, as I would rather promote new growth instead. Next, cut back any lateral canes that overlap one another as these will ultimately compete for sun light once the leaves open up. Lastly, cut back all the remaining canes by one third of whatever their current height is. This will help promote new growth. Pruning time is also a great time to rake up around the base of your hybrid tea roses and clean up any dead leaves or debris that may have collected there. 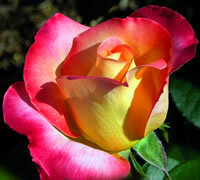 Never let decaying material lay around the base of your roses as these can be an open invitation to pests and diseases. Throw this material away with your cuttings in the trash. Never toss them into the compost bin or pile as many spores and such can survive even the cold winter months and they will gladly re-infect plants the following spring if you spread infected compost soil around your garden. I will always finish up my pruning by giving my hybrid teas a fresh layer of mulch to start off the growing season.